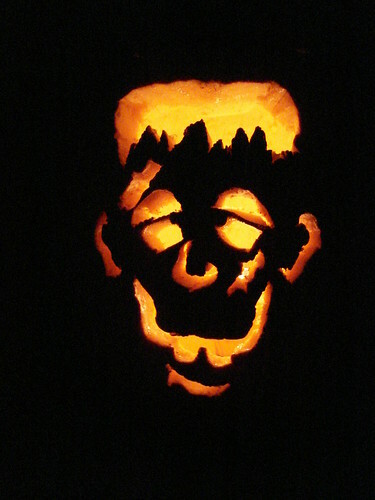 Looking for the best, free Halloween Jack-O-Lantern Pumpkin Carving Templates on the web? I’ve compiled a list of over 40 different places where you can find free pumpkin carving patters to use as your Jack-O-Lantern Templates for this Halloween. There are traditional, geeky, political, scary and fun patterns here - something for everyone. A little off-topic for GeekTonic, but I wanted to share. 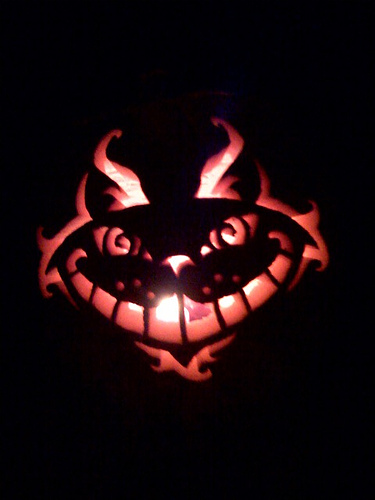 Each Halloween, my daughter and I spend an evening carving several jack-o-lanterns for Halloween. She usually does two that turn out fantastic and then I do one or two as well. Each year, we scour the Internet to find free printable templates to help in the carving or at least to give us some ideas. 1. Jasmine’s Gallery – Political pumpkin carving patters including McCain, Obama, Palin and a lot more. Also includes some more traditional patterns. 2. Stoneykins – a very nice collection of patterns for everyone. Music-themed jack-o-lanterns, political, Sesame Street and other kids themes etc. 6. Disney - Disney character patterns! 8. Jack-o-Lantern.com - Here at the appropriately named Jack-O-Lantern.com you'll find a pretty nice selection of patterns. One unique inclusion here is a how-to on making a pattern of your own (or anyone's) face using a photograph and a graphics editing program such as Paint Shop Pro or Adobe Photoshop. 11. Pumpkin Lady - Lots of free patterns as well as several "premium" ones. 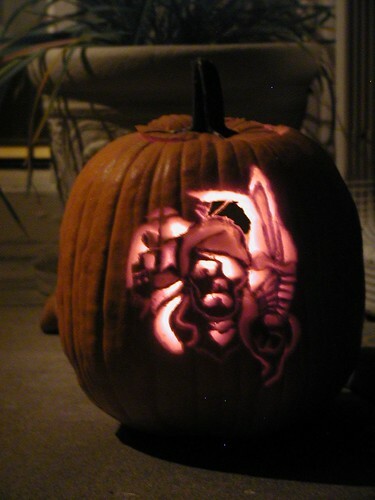 You'll also find one of the better how-to's on carving your Jack-O-Lantern as well. 13. Celebrating Halloween – Some more traditional patterns mixed with some unique ones. 16. Hersheys - Everyone's favorite candy company has 24 different patterns with 12 each of easy, intermediate and advanced patterns. 18. Hewlett-Packard - HP has 7 different patterns for your carving pleasure. 19. Home Depot – 10 fairly difficult patterns that they hope will encourage you to purchase their Pumpkin-carving dremel :) Tip: If you really want a pumpkin dremel use a real one or buy the Pumpkin Dremel at Amazon (affiliate) to save a few bucks. 21. The Pumpkin Wizard – This is a very popular site with many free patterns and some additional members-only patterns here including traditional, patriotic, sports teams, celebrities and more. It was so popular last year that the site went down several times the week before Halloween so check it out early. 23. Zombie Pumpkins - Some free some not - includes Mario, World of Warcraft patterns among others you don't see on any of the other sites listed here. 26. FabulousFoods – Several moderate to complicated patterns here including some traditional templates as well including Screaming Skull, The Green Man, Skeleclown and more. 28. Yankee Halloween - has a US Flag pattern for free and advertise their many jack-o-lantern pattern books you can purchase. 31. CBC News - CBC has some unique patters for Jack-O-Lanterns and a few non-jack-o-lantern pumpkin carving ideas. 34. DIY Network - The DIY Network has several Jack-O-Lantern patterns, how-to's and other Halloween crafts for you. 35. Allrecipes.com - AllRecipies.com has 6 Jack-O-Lantern patterns from Reader's Digest. 37. EvilMadScientist - Here you will find the geekiest of all Jack-O-Lanterns. 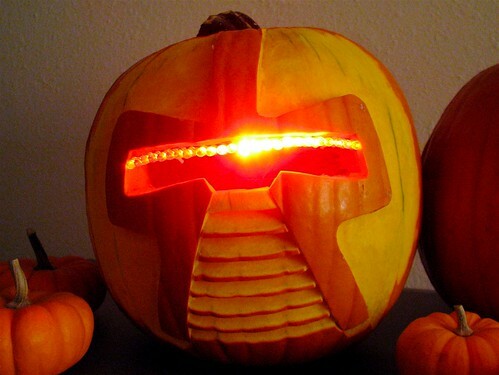 It's a Cylon jack-o-lantern and has the how-to, but you'll need to do some electronics work to make this one. 38. Fantasy Pumpkins – My favorite of the bunch. I don’t have the talent for most of these, but I love seeing what they come up with each year. Check out the Death Star, Diablo II, Mars Attacks and much, much more. Many how-to’s on the individual pumpkins with stencils and videos as well. A Must-see for anyone who likes carving or just seeing amazing Jack-O-Lanterns. 42. Flickr Jack-O-Lantern Group - If you just need some inspiration for your own design and would like to see some photos of jack-o-lantern's created by others, be sure and check out the Jack-O-Lantern Group at flickr. 43. Star Wars Patterns- All kinds of awesome Star Wars themed pumpkin carving patterns including Yoda, Tie Fighter, X-Wing Fighter, Sith, Darth Vader, Stormtrooper and more! 44. [NEW! 2009] ThinkGeek Geeky Patterns - I large compilation of some really geeky pumpkin patterns. I love em'! 45. Pumpkin Pile - Cartoons, Super Heroes, Sports, Video Games, Words, and more. A really nice addition to the list for 2011! 46. Sweet Happy Life - 20 relatively easy but nice patterns. New to the list 2011! 50. Gannett.com - a pretty nice collection of patterns - added 2011. Metacafe - A video how-to for a small, LED Jack-O-Lantern. Cool. If you want to share your jack-o-lantern from this year or past year’s post a link in the comments below.